Since the past few days, we’ve been hearing about Apple’s supposed iOS 8 Healthbook app endeavors, and today, a new screenshot released into the wild via China’s Twitter-like service Weibo offers what appears to be a legitimate glimpse of the app running on iOS 8. If recent insight is anything to go by, Apple has some significant implementations and enhancements in the offing for iOS 8, and with health-related apps and products currently at the forefront of the mobile market, it’s not surprising that the Cupertino is looking to join the party. Although, at this stage, it is unknown as to whether the so-called ‘iWatch’ will even manifest itself this year – let alone if or how it will integrate with this dynamic new fitness, nutrition and activity tracker – from what we’ve already seen of Healthbook, it will almost certainly be one of the key focal points of iOS 8. 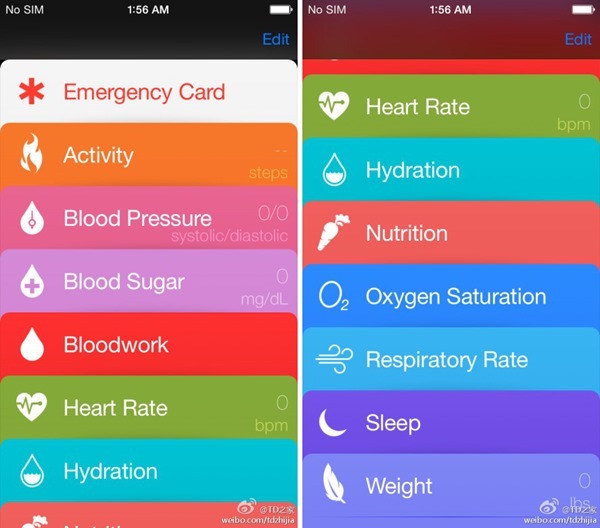 The mock-up of iOS 8 Healthbook app by 9to5Mac we saw a couple of days back is incredibly similar to what has been leaked today via Weibo, borrowing many of its aesthetic quirks from the Passbook app that Apple first threw out with iOS 6. The native ticket and voucher hub promised much, but as yet, has delivered precious little in its quest to service as our digital wallet, but while Passbook was arguably a half-baked featurette that has been given precious little attention since its initial roll-out, Healthbook looks as though it will go in the opposite direction. Revisiting the topic of the iWatch momentarily, it is widely presumed that Apple will finally bite at some point in 2014, although despite reports last year of the fruit company having tasked a 100-strong team with its development, we’ve seen precious little evidence that a smartwatch is indeed on the agenda. Certainly, with Google having just announced the Android Wear SDK specifically for wearable gadgets, closely followed by the announcement of the Moto 360 smartwatch from Motorola, holding back on the iWatch for another year or more would seem counter-productive, to put it mildly. However, with Healthbook apparently boasting so much functionality, a smartwatch would seem the perfect accompaniment to all of its various tracking and monitoring features, and as we look forward to utilizing its card-like interface for the benefit of our wellbeing, let’s hope it’s not the only health-related product Apple releases this year.